1. Peel and grate the carrot and ginger together in a grater. 2. Heat oil in a kadai( or a pan) and when hot simmer the stove and add mustard seeds, curry leaves, dry red chillies. 3. After few seconds take the kadai (or pan) off the stove and put it aside. 5. 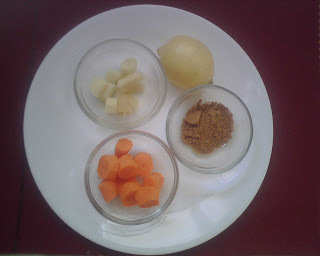 After few seconds add the carrot-ginger mixture to the above and mix well. 6. Let wait till the whole thing cools down. When its cold take the juice of the lemon and add it to the above mixture and mix well. 7. Taste the pickle for salt. If you think it has less salt add it. 8. Store it in a air tight container in the fridge. Its ready to eat immediately, but tastes better next day. Will last for a week in fridge. I tried to take pictures from my camera phone. I hope they are clear. Hi Lavanya - the pickle sounds great. A fantastic contribution to JFI-Ginger. 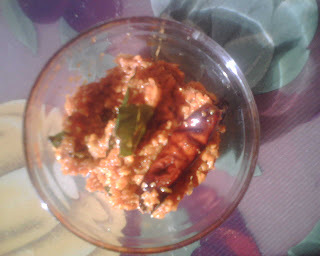 Nice recipe Priya, I love the way it looks...like a paste. Oh! I really liked it. I have never tried making pickles at home, but this recipe is too tempting so I think I will give it a shot. Thanks for sharing!